I must tender an apology, my good sir, but as every gentleman knows, 'He who smelleth it, dealteth it'! Or, as some would have said, the Floundering Fathers. Today, our country bases it's laws on something called 'The Constitution'. But that wasn't always the case. During and in the years immediately after the Revolutionary War, the new country of America based it's laws on 'The Articles of Confederation'. The articles were drafted in 1776, and sent to the 13 colonies for ratification in 1777. They were finally ratified in 1781, and officially, became the law of the land. But, even before the colonies ratified them, they were used. 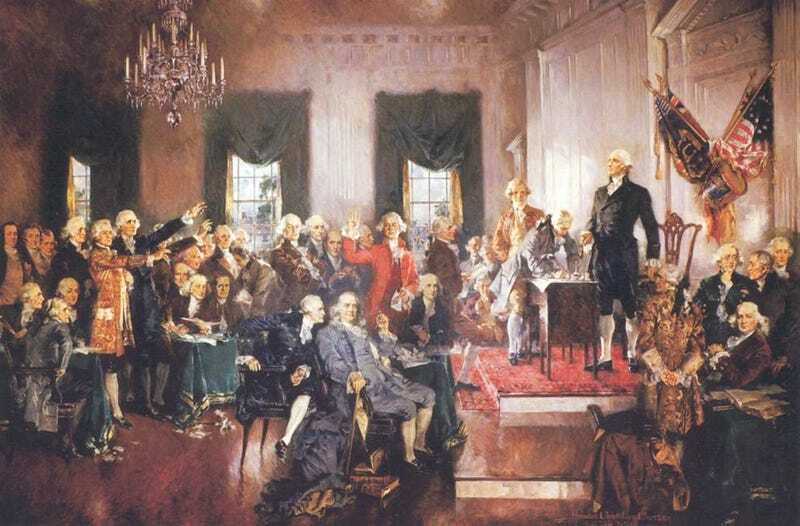 They remained in place until the constitution was created to replace it, in 1787. One of the main problems with the articles was, they didn't give the government the power to do....anything. So, they had to go. That's not entirely true. Congress could print money, but there was nothing backing it, so it was worthless. They could borrow money, but had no way to pay it back. They didn't have to power to enforce the taxes. Georgia and New Jersey didn't pay any, and the rest of the states never paid what they owed. So, in February of 1787, the constitutional convention was proposed. And on the day they agreed to meet, only two states showed up. It took about a month for a quorum of seven states to show up. Eventually twelve states had representatives present. They agreed on 74 delegates, of which, 55 were present, and 39 signed the document formalizing the constitutional convention. 19 of the selected delegates never even showed up. The road leading to the constitution was a difficult one. The convention took place in Philadelphia, in Independence Hall. The same place where the Declaration of Independence was signed. Raise your hand if you've been to Independence Hall. *raises hand* I've been there several times. I've lived in the Philadelphia suburbs twice in my life, and have had the opportunity to visit where our country started a few times. For those of you who haven't been there, allow me to enlighten you. The room where they met was small. Not tiny, by any means, but for the number of men participating, it was small. Maybe 40 x 40, max. Most of the time when you visit, the actual room is blocked off, as they have it laid out as it was when the declaration was signed. A lot of desks and chairs. The last time I was there, however, Independence Hall was undergoing renovations, and all the furniture was cleared out of the room, so the public was free to go in. It really wasn't that big. There were maybe 25 people there, and while we weren't crowded, with the furniture and 74 men, it would have been very crowded. Most of the deliberations took place in the summer months. Spring was planting season, and the delegates had farms/plantations/businesses to take care of as well. For those of you who have never been to Philadelphia in the summer, don't go. It's miserable. Temps will easily reach the 90's, with dew points in the 70's. In plain english, it get's hot. Hot, humid and sticky. The kind of heat that makes it hard to breathe. Where you sweat just thinking about moving. Now, keep in mind the fashion of the day. Powdered wigs. Woolen britches, with wool stockings, wool shirts with wool vests and wool jackets. Have you ever worn wool? People tend to wear it in the winter months because it keeps you warm. And the summer of 1787 was a hot one, too. Now, imagine 74 men, packed tight in a small room, all wearing warm clothing, sweating like pigs, in an era when baths were taken maybe once a week. Discussions were heated. Not all the states wanted the same things. Tempers flared. It stank. But, finally, a constitution was agreed on. No one was happy with it, but it was the best they were going to get. And, everyone wanted to be done. And that's how, on September 15, 1787, the constitution had been agreed on, and the party started. Now, remember, no more than 80 people drank all that booze. Some will say that the booze back then wasn't as strong as it is now. or that they drank more, and therefore had built up a tolerance. I say, it doesn't matter. That's a lot of booze, and those dudes were wasted! September 16th, 1787, was reported to be a day of hangovers for the delegates. None of them were up to reconvening to sign the document they worked so hard to create. That's why the constitution was signed on September 17, 1787. Even though it was done two days earlier. Let's take a moment and extrapolate this part to modern times. Can you imagine congress, or the senate, passing some piece of legislation, and then having a raucous party where they practically empty the capitol of booze? So, when you get home from work and have a bottle of wine, or a 12 pack of beer on the weekends, don't feel bad. You're just following the example of the founding fathers.